Need Advice in Cooking Fresh Pasta - Can You Help? Look at this gorgeous rigatoni pasta I made with the phenomenal Pasta Press I received from KitchenAid for my Stand Mixer. Look it! Is that not cool or what?? I work better with a computer than with a stove, but with the help of my KitchenAid stand mixer, along with their attachments, I can actually look like I know a thing or two in the kitchen, lol! Maybe its because a stand mixer is tech that I can understand? Hmm…. I LOVE pasta, so when asked if I’d like to learn how to make my own with the help of my trusty stand mixer, I was all kinds of excited and my mixer didn’t let me down. 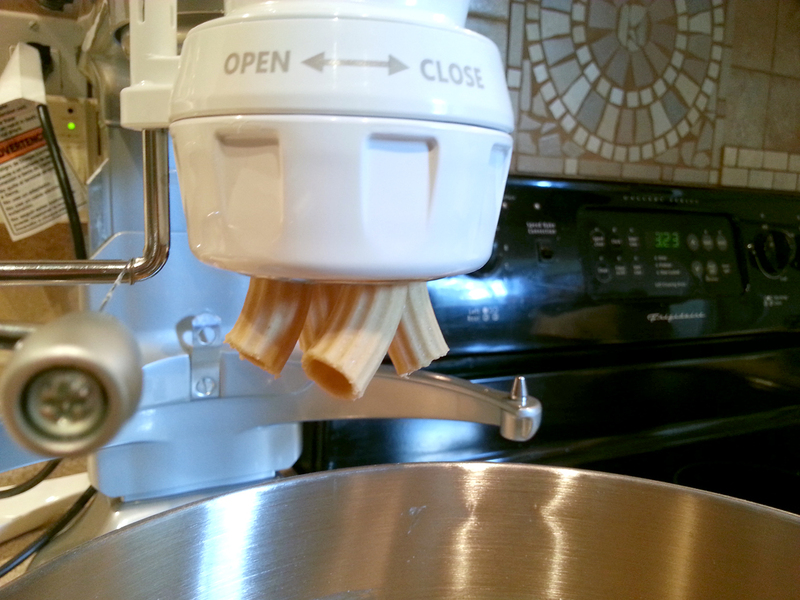 All you need is about 30 minutes and this fabulous Pasta Press attachment to make homemade pasta, did you know it was that easy? I made that vid before I realised my mistake of making the balls of pasta a little too big. It took me some trial and error, but I realised afterwards that to make the dough come out really fast, the balls of dough should be a smidgen smaller to the size of walnuts… more like chestnuts, I guess. 🙂 When I re-balled the dough to smaller sizes, the pasta press just flew in making pieces of rigatoni. So if you have one of these babies at home, but are having a hard time making the pasta come out, go smaller! So yeah, I don’t need help with making the actual pasta, as the KitchenAid Pasta Press makes it a cinch to whip up some homemade large or small macaroni, fusili, rigatoni, bucatini, fusili and spaghetti! What I need help with is the cooking part of it. I get that fresh pasta is different than the store bought dry stuff, that it will taste different, but I need advice on how to make a pot of it taste… well, cooked. So what are your tips? What do you do so that the result doesn’t taste dough-y. Do I need to let the shaped dough dry out a bit before putting it in a pot of boiling water? I DO know not to leave the pasta bits standing in the metal mixing bowl next time! 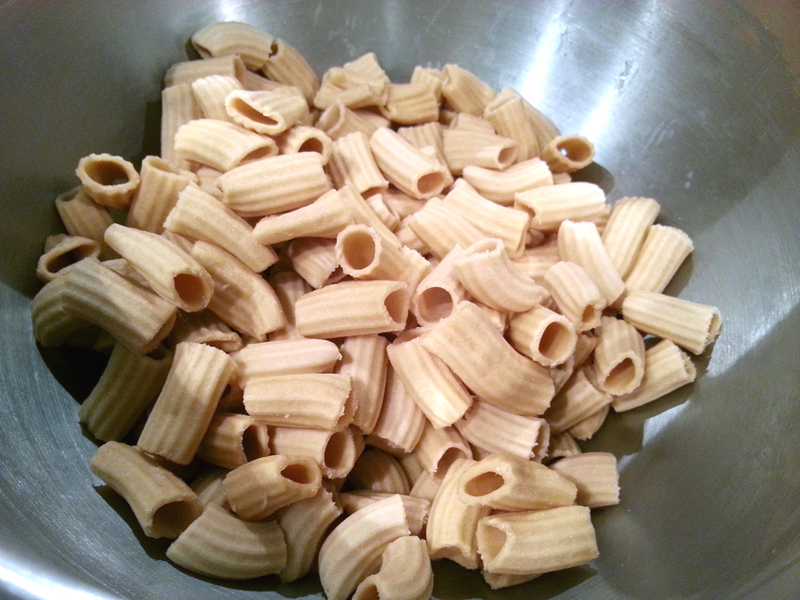 The rigatoni at the bottom of the bowl got flattened and sticky from the weight and moisture from the bits above and wound up sticking together in big clumps. I’m wondering if that one mistake is all it took for the pasta to not cook as well as I had hoped. The recipe itself was fine, the pasta is essentially egg and flour, and I’ve found a ton of similar recipes online, on TV and in the KitchenAid Pasta Press recipe book to know that I’m doing the right thing there. Making egg noodles are a breeze! 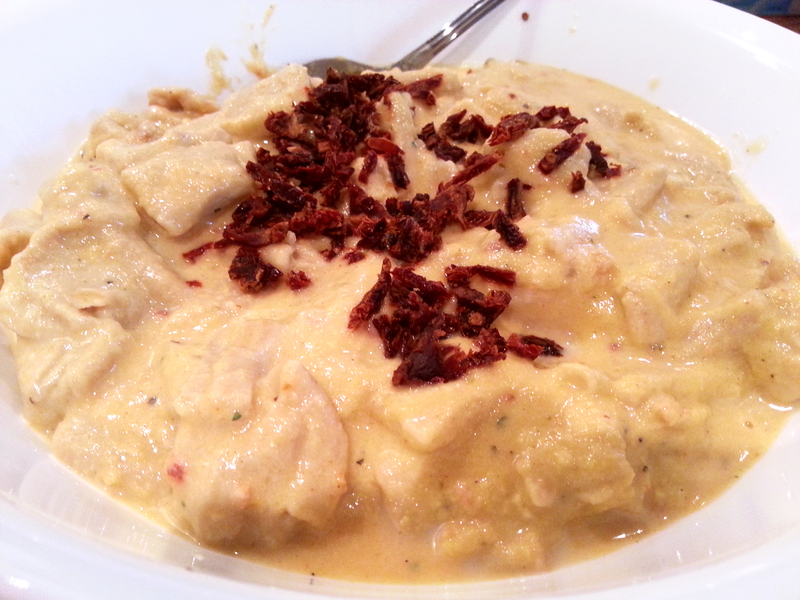 And the roasted butternut squash and sun-dried tomato sauce was amazing! 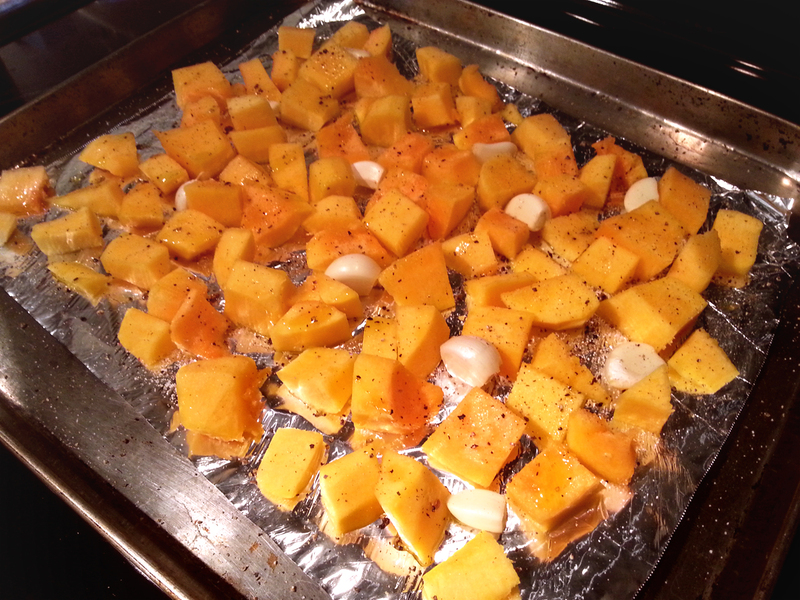 I’m a huge fan of anything butternut and this sauce too was easy to prepare; a bit of roasting, a bit of time in the food processor; a cup of cream, and bam! Homemade pasta sauce to go on to off the homemade pasta. I think short of growing these veggies in my backyard garden, and milking a cow, this was the closest to “from scratch” for a meal I’ve ever put together. Have you tried any of KitchenAid’s attachments with your stand mixer? 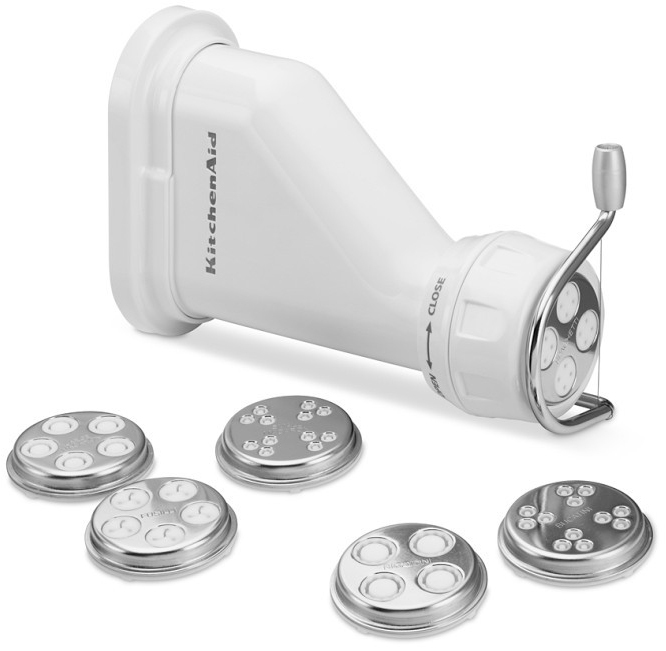 There is an incredible array of gadgets to use with your mixer to make fresh cooking a breeze. I think my Dear Santa list this year is going to include the Vegetable & Fruit Strainer and Grinder this year! It would be a step in the right direction for making homemade tomato based sauces and fruit sorbets! Should just be 5 minutes uncovered in at least a gallon of water (for rigatoni) once the water has come back to a boil (it stops for a bit after you add the pasta). Then drain/strain (don’t rinse) and you’re good to go. As for drying, yes, you need to let the pasta dry for between 30 and 120 minutes, until it is no longer squishable back into dough. WOW look at you all fancy pasta -ing! Looks delish. My Mother in Law makes it by hand but not this tyoe of pasta! No advice, I just wanted to say that the end result looks delish! Mmm, mmm, that sure does look good.